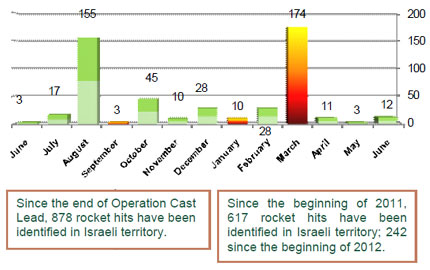 Since the end of Operation Cast Lead, 878 rockets hits have been identified in Israeli territory (total as of June 19). SMC also conducts visits for students, ambassadors, journalists, and private people to Sderot, enabling outsiders to view up-close the security situation of Sderot residents. SMC also initiates social advocacy and community projects for Sderot. Examples of past projects include the “Shotetut” photo gallery where Sderot children were given cameras to document life under rocket fire. At the conclusion of the project, a photo gallery featuring the photographs taken by the Sderot children was opened for visitors. SMC has also established a campaign to form a Knesset Members’ committee that will represent local residents who seek fair compensation from the Israel Tax Authorities for properties damaged by Qassam rockets. Finally, SMC recently held a “Creative Writing” Project for the Sderot community, where local residents of all ages wrote poems, songs and short stories, expressing their experience with rockets and what life in Sderot and the Negev region entails. * Rocket hits identified in Israeli territory. A similar number misfire and customarily land inside the Gaza Strip. Note: The March tally includes 50 rockets from the Gaza Strip which were intercepted and destroyed by the Iron Dome aerial defense system during the latest round of escalation. The June figures are as of 12:00 on June 19. On April 16, 2001 the then Saudi Arabian-backed Hamas terrorist organization launched its first rocket into Israel. To date, more than 12,700 rockets and mortars, an average of 3 attacks every single day, have landed in Israel endangering the lives of more than 1,000,000 civilians. Since the early morning hours of June 19, Gaza-based terrorist groups have launched a barrage of mortars and rockets towards Israeli population centers in southern Israel. 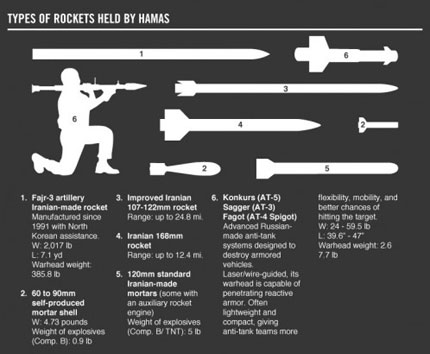 Hamas, Fatah’s armed wing, the Popular Resistance Committees, and the Palestinian Islamic Jihad have taken responsibility for several of the launches. The active participation of Hamas along with the other terrorist groups in this latest escalation marks a significant shift in the organization’s policy, as it has avoided direct participation in the previous escalations since March 2011. On June 19, a rocket hit near Kibbutz Yad Mordehai, moderately injuring a Border Guard Police soldier and lightly injuring four others. Another rocket hit Pri Gan and caused structural damage to several buildings. In addition, a rocket hit a home in Kibbutz Saad, causing structural damage but no casualties. The rockets are predominantly launched from heavily populated areas in the Gaza Strip, including Beit Hanun, Jabaliya, Rafah and several neighborhoods in Gaza. In response, the IAF has initiated a number of pinpoint strikes, targeting operatives and terrorist infrastructure in the Gaza Strip, including weapons production facilities, military positions and tunnels intended for terrorist attacks. During the week of June 13-19, 2012 eight rocket hits were identified in Israeli territory (as of noon June 19). Two of them were apparently fired from the northern Sinai Peninsula. The other six were fired on June 18 and 19 and fell in the western Negev. All the rockets fell in open areas; there were no casualties and no damage. On June 16 the remains of two 122mm Grad rockets were identified in Israeli territory, one near Udva (north of Eilat). A number of hours later the remains of the second rocket were found near the central Negev town of Mitzpe Ramon. Both rockets landed in open areas; there were no casualties and no damage. On June 18 a three-man terrorist squad infiltrated into Israeli territory from the Sinai Peninsula near the village of Be’er Milka along the Israeli-Egyptian border. The terrorist operatives crossed the border at a site where the security fence has not yet been constructed. They detonated an IED to attack two vehicles belonging to the contractor building the fence. At the same time, they launched an RPG (which missed its target) and opened fire with light arms. The shots caused one of the vehicles to fall into a ditch, killing one of the passengers. The victim of the attack was Said Fashapshe, 35, from Haifa, married and father of four. He was employed by the contracting company constructing the security fence along the Egyptian border. During the week of June 6-12, 2012 one rocket hit was identified in an open area in the Western Negev. There were no casualties and no damage. During the week of May 30 – June 5, 2012, three rocket hits were identified in Israeli territory in the western Negev. On the night of June 3 two rockets landed in open areas in the western Negev; there were no casualties and no damage. On the night of June 4 a rocket landed in a wheat field near Ashkelon, setting the field on fire. There were no casualties. During the week of May 9-15, 2012, one rocket hit was identified in an empty area in the western Negev. There were no casualties and no damage. During the week of May 2-8, 2012, two rocket hits and one mortar shell hit were identified in the western Negev, falling in open areas. There were no casualties and no damage. On the morning of May 1 shots were fired at an IDF force engaged in routine anti-terrorism operations near the security fence in the central Gaza Strip. On April 26, Independence Day, a rocket fire fell in an open area in the western Negev. There were no casualties and no damage. On April 30 a rocket fell in an open area near Sderot. There were no casualties and no damage. During the week of April 18-24, 2012 one rocket hit was identified in an open area in the western Negev. There were no casualties and no damage. On the night of April 15 two rockets fell in open areas in the western Negev. There were no casualties. On April 4, three rockets were fired at Eilat from the Sinai Peninsula. Three rocket hits were also identified in the western Negev (near the cities of Netivot and Sderot) on April 8. During the week of March 28 – April 3, 2012 one rocket adn two mortar hits from the Gaza Strip was identified in Israeli territory. There were no casualties and no damage. During the week of March 15-20, since the arrangement went into effect, nine rockets, including long-range Grad rockets, and four mortar shells hit Israeli territory. In addition, two rockets were intercepted and destroyed by the Iron Dome aerial defense system. During the latest round of escalation (March 9-14, 2012), more than 200 rockets were fired from the Gaza Strip targeting Israel. Of them, 117 fell in southern Israel. The Iron Dome aerial defense system intercepted and destroyed several dozen, preventing hits on populated areas. During the week of February 29 – March 6, two rocket hits and three mortar shell hits were identified in the western Negev. There were no casualties and no damage. During the week of February 22-28,12 rocket hits were identified in Israeli territory. The rockets fell in open areas; there were no casualties and no damage. During the week of February 15-21 there was an increase in the amount of rocket fire into Israel from the Gaza Strip. Eight rocket hits were identified, some of them long-range rockets. On the evening of February 18 an anti-tank RPG was fired from the Gaza Strip at an IDF force, damaging the security fence. When additional forces arrived at the site an IED was detonated from the Gaza Strip. There were no casualties. On the night of February 21, as IDF forces and the Israel Police conducted a joint activity to prevent smuggling across the Israel-Egypt border, a man was seen throwing a suspicious object and then fleeing the scene. 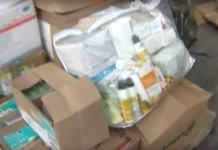 A search of the area revealed that the object was a bag containing a powerful IED which was apparently meant to be used against IDF soldiers or Israeli civilians. The IED was detonated in a controlled explosion. 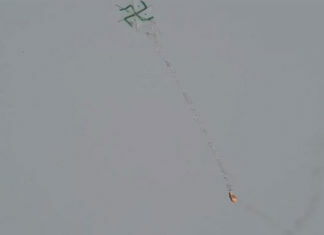 During the week of February 8-14, 2012 two rocket hits were identified in Israel territory. They fell in open areas in the western Negev. One of the rockets damaged a number of structures and caused a power outage. During the week of February 1-7, 2012, five rocket hits were identified in Israeli territory – four on February 1 which landed in open areas in the western Negev. There were no casualties and no damage. During the week of January 25-31, 2012 three rocket hits were identified in Israeli territory, all in open areas. There were no casualties and no damage. During the week of January 18-24, 2012 four rocket hits were identified and four mortar shells were fired. There were no casualties and no damage. On the night of January 18 an IDF force operating the southern Gaza Strip apprehended three Palestinians attempting to infiltrate into Israel through the security fence. During the week of January 11-17, 2012 two rocket hits were identified in open areas in the western Negev. There were no casualties and no damage. During the week of December 28, 2011 – January 3, 2012 six rocket hits (five on Dec 28 and one on Dec 29) were identified in Israeli territory. All the rockets and mortar shells fell in open areas in the western Negev. There were no casualties and no damage. On January 1 two mortar shells containing phosphorous were fired at a village in the western Negev. The military-terrorist wing of the Popular Resistance Committees claimed responsibility for the attack. During the week of December 21-27 three rockets and two mortar shells were fired into Israeli territory from the Gaza Strip. Two rockets fell in an open area in the western Negev on December 24. A third rocket fell on December 26. Two mortar shells fell on December 23 in open areas. There were no casualties and no damage. During the week of December 14-20, four mortar shells were fired into Israeli territory. They landed in open areas in the western Negev. There were no casualties and no damage. Following the killing of two terrorist operatives, rockets and mortar shells were fired into Israeli territory. Between December 8 and 10, 18 rocket hits were identified, some of them rockets with ranges of 40 kilometers (about 25 miles). Eleven mortar shells were also fired. Most of the rockets landed in empty areas in the western Negev. There were no casualties and no damage. The Iron Dome aerial defense system intercepted a 122mm Grad rocket fired at the southern Israeli city of Ashdod (IDF Spokesman, December 9, 2011). 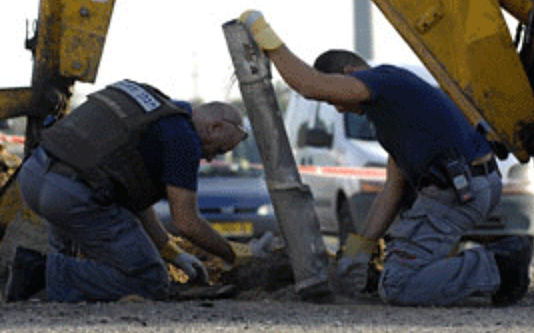 During the week of November 30 – December 6 one rocket hit was identified near the security fence in the western Negev. There were no casualties and no damage. On November 26 two rocket hits were identified in Israeli territory. Both fell in open areas in the western Negev. There were no casualties and no damage. Two rocket hits were identified on November 15. One of the rockets hit a storage shed near a kindergarten in an Israeli village in the western Negev. The other fell in an open area. There were no casualties. During the week of November 9-15 one rocket hit was identified in Israel territory (Nov 13). The rocket fell in an open area. There were no casualties and no damage. During the week of November 2-8 three rocket hits were identified in Israeli territory. They were all launched on November 6, and fell in the western Negev in the Ashqelon district. There were no casualties and no damage. During the week of October 26 – November 1 , 45 rockets and 20 mortar shells landed in Israeli territory, among them standard Grad rockets with a range of more than 40 kilometers (25 miles). The rockets hit large cities (Ashdod, Ashqelon and Beersheba), towns and villages in the south. A resident of Ashqelon was killed and four civilians suffered minor to serious injuries. Several dozen people were treated for shock, and extensive property damage was caused. On September 27 one rocket hit was identified in an open area in the western Negev. There were no casualties and no damage. On September 29 one mortar shell hit was identified in an open area in the western Negev. There were no casualties but power lines were damaged. On October 4 an IDF force patrolling along the security fence was attacked with an IED. There were no casualties and no damage. The force identified four other IEDs and neutralized them. During the week of September 21-27 one rocket hit and one mortar shell hit were identified in open areas in the western Negev. There were no casualties and no damage. On September 9 snipers from the Gaza Strip shot at the Israeli village of Netiv Ha’asara, located near the Erez crossing (northern Gaza Strip). There were no casualties but some of the buildings were damaged. An IDF force reported being shot at in the region of Netafim on the Israeli-Egyptian border (September 12). There were no casualties and no damage. During the week of August 31 – September 6, 2011 two rocket hits were identified in Israeli territory. One fell in an open area in the western Negev on August 31. The second fell in an open area in the western Negev on September 5. There were no casualties and no damage. The round of escalation in the south which began on August 18 with the terrorist attack north of Eilat and continued with massive barrages of rockets targeting Israeli population centers in the south ended on August 26. During the latest round of escalation 149 rockets fell in Israeli territory (of the 200 fired). It was the worst round since Operation Cast Lead. However, daily sporadic rocket fire targeting Israel continues. On August 26 two rocket hits were identified in open areas in the western Negev – no casualties and no damage. On August 27 two rocket hits were identified in the western Negev – no casualties and no damage. On August 28 two rocket hits were identified, one of them a standard 122mm Grad rocket, which hit near Beersheba. There were no casualties and no damage. On August 19 a synagogue and a school in Ashdod were hit by rockets fired from Gaza. One person was seriously injured, and some ten were wounded. There was extensive damage to the building. On August 20 two Grad rocket hits were identified in Beersheba, causing the death of one Israeli civilian, critically wounding four others and inflicting varying degrees of injuries on three others; considerable damage was done to one house in the city. On August 20 two Grad rocket hits were identified in the region of Ashdod. 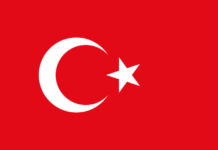 Four civilians were wounded, one of them critically; several structures were damaged. On August 20 two more Grad rocket hits were identified in the region of Ashdod. Six civilians were wounded, three of them critically; one sustained minor injuries and two were treated for shock. On August 20 three rocket hits were identified in Ofakim, wounding several people including a four-month-old baby and causing severe damage. On August 15 a 122mm Grad rocket fell in an open area near Beersheba. No casualties and no damage were reported. During the week of August 3-9, three rocket hits were identified in Israeli territory. Two of the rockets had longer ranges than usual and landed near the southern Israeli city of Kiryat Gat – an improved locally-manufactured rocket (August 3) and what was apparently a 122mm Grad rocket (August 4), after which a number of civilians were treated for shock. Another rocket fired on August 4 landed in the western Negev. Five mortar shell hits were identified in Israeli territory. They fell in open areas in the western Negev. No casualties were reported and no damage. During the week of July 27-August 2, two rocket hits were identified in the western Negev (July 28 and August 1). An Israeli civilian woman suffered minor wounds from the rocket fired on August 1. During the week of July 20-26, one rocket hit was identified in the western Negev. During the week of July 13-19, 11 rocket hits were identified in Israeli territory and one mortar shell was fired. Most of the rockets fell in open areas in the western Negev. There were no casualties and no damage. During the week of July 6-12, two rocket hits were identified in Israeli territory (July 9). The rockets fell in open areas in the western Negev. There were no casualties. During the week of June 29 – July 5, one rocket hit was identified in Israeli territory (July 3) in an open area in the western Negev; there were no casualties and no damage. On July 2 two mortar shells fell in an open area in the western Negev. During the week of June 22-28, two rocket hits were indentified in Israeli territory (June 21) in an open area in the western Negev. There were no casualties and no damage. During the week of June 15-21, one rocket hit was indentified in Israeli territory (June 16) in an open area in the western Negev. There were no casualties and no damage. During the week of May 25-31, one rocket hit was identified in an open area in the western Negev (May 28). There were no casualties and no damage. It was the first rocket hit since April 18. 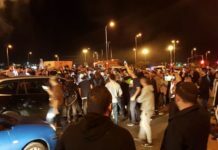 May 15 (Naqba Day) was marked by violent confrontations between IDF soldiers and scores of rioters who assembled on the Palestinian side of the Erez crossing. The Passover holiday was marked by relative quiet, with two rocket hits identified in Israeli territory: On April 15 a Grad rocket landed near the city of Ashdod; there were no casualties and no damage. On April 18 a rocket hit was identified in an open area in the western Negev; there were no casualties and no damage. On the afternoon of April 7, Hamas operatives fired a laser-guided anti-tank missile at an Israeli school bus in the western Negev wounding two people, one – a 16-year-old teenager – critically. From April 7-10, 65 rockets and 67 mortar shells fell in Israeli territory. Some of the rockets were long-range and fell in the regions of Beersheba, Ashqelon and Ashdod. Eight of them were intercepted by the Israeli Iron Dome aerial defense system. During the week of March 30-April 5, 2011, three rocket hits were identified in Israeli territory. All three rockets fell in open areas in the western Negev. There were no casualties and no damage. During the week of March 22-29, 2011, 13 rocket hits and 18 mortar shell hits were identified in Israeli territory. • On March 23 six mortar shell hits were identified in the western Negev south of Ashkelon. One of them contained phosphorous. • On March 24 five rocket hits were identified, one of them a Grad rocket which landed near the southern Israeli city of Ashdod. Five mortar shell hits were also identified, all fired simultaneously, falling in open areas in the western Negev. • On March 26 two rockets landed in the western Negev. There were no casualties but damage was done to property. On the morning of March 19 exceptional barrages of 120 mm mortar shells struck the western Negev. The mortar shells were fired simultaneously from a number of sites in the Gaza Strip. A total of 49 shell hits were identified, most falling in open areas. Two people sustained minor injuries and considerable damage was done to property. It was the most serious mortar shell attack since Operation Cast Lead. In addition, during the week of March 15-22 four rocket hits were identified in Israeli territory, one south of the city of Ashkelon on March 20. No damage was done. Several Israelis were treated for shock. Six additional mortar shells were fired into Israeli territory. There were no casualties and no damage. During the week of March 9-15, 2011 two rocket hits and one mortar shell hit were identified in open areas in the western Negev. There were no casualties and no damage. During the week of March 2-8, 2011 two rocket hits were identified in Israeli territory. They fell in open areas in the western Negev on March 5. There were no casualties and no damage. On March 1 an anti-tank missile was fired at an IDF tank engaged in routine activity near the border fence in the southern Gaza Strip. It was successfully intercepted by a new system called Windbreaker, which destroyed it before it reached its target. 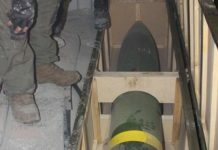 During the week of February 23 – March 1, 2011 six mortar shell and three rocket hits were identified, including a 122mm Grad rocket which fell in the southern Israeli city of Beersheba. The rocket hit a house and caused considerable damage to the building and its surroundings. Four people were treated for shock. On February 19 one rocket hit was identified in the western Negev; there were no casualties and no damage. On February 14 one mortar shell hit was identified in the western Negev; there were no casualties and no damage. During the week of February 2-8, 2011 one rocket hit was identified in Israeli territory (February 4). It landed in an open area in the western Negev. Two mortar shell hits were identified on February 6, and five more on February 8. There were no casualties and no damage. 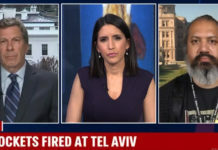 Three rocket hits – two of them Grad rockets – were identified on the night of January 31, 2011, and fell in open areas in the southern Israeli towns of Netivot (close to a site where a wedding was being held) and Ofakim. Four people went into shock and several vehicles were damaged. One mortar shell fell in an open area in the western Negev. There were no casualties and no damage. One rocket hit was identified on January 21. The rocket fell in an open area in the western Negev. There were no casualties and no damage. During the week of January 12-18, three rocket hits were identified in the western Negev (on January 11, 17 and 18). The rockets fell in open areas. There were no casualties and no damage. 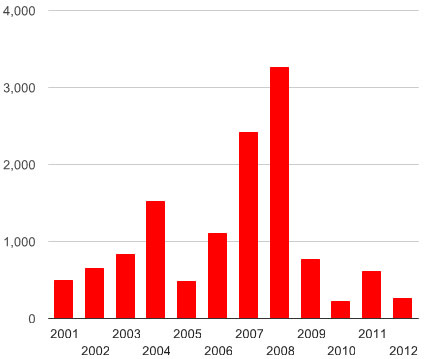 During the week of January 5-11, 2011 there was a increase in the number of rockets and mortar shells fired from the Gaza Strip into Israeli territory. Eight rockets and 13 mortar shell hits were identified in towns and villages in the western Negev. Six civilians were wounded, one of them critically. On January 5, seven rocket hits were identified in the western Negev. There were no casualties and no damage. On January 6,m seven mortar shell hits were identified over a 24-hour period. Two mortar shells hit a building and wounded six foreign workers, one of them critically and one seriously. On January 10 three rocket hits were identified near the city of Ashkelon and one in an open area. There were no casualties and no damage. On January 7 a rocket hit was identified near the security fence. There were no casualties and no damage. During the week of December 19, 2010 – January 4, 2011 two rocket hits were identified in the western Negev (December 28 and 30). They fell in open areas. There were no casualties and no damage. Three mortar shell hits were identified in the western Negev. On January 1 a women in the western Negev went into a shock. During the week of December 21-28 five mortar shell hits were identified in Israel territory, most of which fell in open areas. On December 24 a rocket hit was identified in an open area in the western Negev. There were no casualties and no damage. During the week of December 15-21, 15 mortar shells were fired at the western Negev. On December 20, 12 mortar shells were fired and landed in open areas. On December 19 three mortar shells were fired and landed in open areas. There were no casualties and no damage. A rocket hit was identified on December 21. It fell in the western Negev. A young woman sustained minor injuries. On December 8 two rocket hits were identified in Israeli territory. There were no casualties and no damage. In addition, six mortar shells were fired into the western Negev, two on December 7 and four on December 8. In the December 8 attack an Israeli civilian sustained minor injuries. During the week of November 30 – December 7, two rocket hits and one mortar shell hit were recorded in the western Negev. On December 6 one of the rockets fell in the western Negev, causing no injuries or damage. During the week of Novemer 16-22, 2010, six mortar shells were fired into Israeli territory. They fell in open areas in the western Negev. There were no casualties and no damage. At least one of the mortar shells contained phosphorous. On November 16 a rocket hit was identified in an open area in the western Negev, causing damage to property. On November 19, three rocket hits were identified, including a 122 mm Grad rocket in Ofakim. There was damage to property and livestock. On November 6, 2010 one rocket hit was identified in the western Negev. On October 27 and 28 two mortar shells were fired at an IDF force conducting routine security activity. There were no casualties and no damage. On October 25 a number of mortar shells were fired at an IDF force conducting routine patrols. Three mortar shell hits were identified in the western Negev. During the week of October 6-12, 2010 one mortar shell hit and one rocket hit were identified in Israeli territory. During the week of September 27 – October 5, 2010 two rockets fell in Israeli territory in the western Negev. During the week of September 22-27, 2010 one rocket hit was identified in Israeli territory. During the week of September 15-21, 2010 nine mortar shells were fired into Israeli territory, eight of them on September 15. They fell in open areas in the western Negev. There were no casualties and no damage. During the week of September 7-14 there was an increase in rocket fire targeting the western Negev. During the week (which included Rosh Hashanah, the Jewish New Year) nine rocket hits were identified in Israel. Most of them fell in open areas. There were no casualties and no damage. During the week of September 1-6, one rocket hit was identified in the western Negev. There were no casualties and no damage. On August 16 two Kassam rockets fell in the northwestern Negev. On the morning of August 17 two mortar shells were fired at an IDF force near the security fence. Two soldiers sustained minor wounds. Two mortar shells fell in an open area in the northwestern Negev. On August 16 Israeli security forces prevented an attack against IDF forces with an IED near the security fence in the southern Gaza Strip. One of the terrorists was killed – a prominent member of the Palestinian Islamic Jihad who took part in the exchange of fire five months ago in which an IDF soldier was killed – and an IDF soldier sustained minor wounds. On July 30 a 122mm Grad rocket fell in the southern city of Ashkelon, sending one Israeli woman into shock. On July 31 a rocket fell near an educational building in the western Negev. There were no casualties but the building was severely damaged. On August 2 six rockets were fired at Israel. Three fell in Eilat. There were no casualties. Two rockets fell in the Jordanian city of Aqaba. A Jordanian civilian was killed and five were wounded, one of them critically. During the week of July 20-27, five rocket hits were identified, four of them on July 24. There were no casualties and no damage. On July 20 a mortar shell was fired at an IDF force on routine patrol along the security fence. On July 19 a mortar shell was fired at IDF soldiers on a routine patrol along the security fence. On June 30 one rocket his was identified in the western Negev. A local factory was damaged. On June 24, 12 mortar shells were fired from the Beit Hanoun region at an IDF force engaged in routine security activities. Six fell in Israeli territory. The force was also attacked with light arms fire. On June 28 a mortar shell was fired at an IDF armored vehicle. The vehicle was damaged. During the week of June 16-22 two rocket hits were identified near the security fence in the western Negev. There were no casualties and no damage. A number of IEDs were detonated and light arms were fired at IDF patrols near the security fence. During the week of June 9-15, one rocket hit was identified in the western Negev. On June 9 an IED exploded near an IDF force on routine patrol near the security fence in the southern Gaza Strip and on June 14 near an IDF force carrying out routine security activities in the southern Gaza Strip. There were no casualties and no damage. During the week of June 2-8, six rocket hits were identified in Israeli territory, three on May 31 and three on June 1. All the rockets fell in open areas. There were no casualties and no damage. On June 1 an anti-tank missile was fired at an IDF force engaged in routine security activity near the border fence in the southern Gaza Strip. On two occasions (June 1 and 7) the Israeli Air Force attacked rocket-launching squads which were about to fire rockets into the western Negev. On June 7 an IDF force attacked a commando terrorist squad at sea. The squad was apparently on its way to Israel from the sea to carry out a terrorist attack. Four members of the squad were killed. During the week of May 26 – June 1, seven rocket hits were identified in the western Negev (five of them on May 26). The rockets fell in open areas. There were no casualties and no damage. On May 25 an IDF force identified a suspicious Palestinian driving a wagon close to the security fence. After he distanced himself from the wagon, which was apparently booby trapped, it exploded. There were no casualties. On the morning of June 1 an IDF force identified two terrorist operatives who crossed the security fence in the southern Gaza Strip. During the ensuing exchange of fire the terrorists were killed. During the week of May 18-25, two rockets fell in Israeli territory (May 19 and 20). They exploded in open areas. On May 21, two terrorists infiltrated into Israeli territory near Nirim in the western Negev. IDF forces shot and killed them. Two assault weapons and magazines were found near the bodies. On the evening of May 21, during a routine patrol in the southern Gaza Strip, an IDF scout was seriously wounded by sniper fire. During the week of May 11-17, a mortar shell was fired at an IDF force carrying out routine operations near the security fence; civilian engineers working near the security fence and and IDF force carrying out routine activities near the Kissufim post were attacked with light arms (May 12); two IEDs exploded near an IDF force carrying out routine operations at the security fence, damaging the fence (May 14). During the week of May 4-11 one rocket hit was identified in the western Negev. There were no casualties and no damage. IDF soldiers were attacked twice with light arms near the border fence. During the week of April 27-May 4 small arms fire was opened several times on IDF soldiers engaged in routine security activities near the border fence. There were no injuries. On April 25 light-arms fire targeted civilians engaged in non-military activities near the security fence. There were no casualties. On the same day, an IDF force found three mines near the security fence in the central Gaza Strip. On April 16, an IDF force identified a suspicious figure apparently trying to set an IED near the security fence along the Gaza Strip, near Kfar Aza. The terrorist threw a grenade at the force. The IDF force returned fire and killed him. In the early morning hours of April 13 an IDF force identified a terrorist squad in placing an IED near the security fence close to the Kissufim crossing. On March 26 an IDF officer and soldier were killed and four others were wounded near the Kissufim crossing in the central Gaza Strip. The Izz al-Din al-Qassam Brigades, Hamas’ military-terrorist wing, claimed responsibility for the incident. Rocket and mortar shell fire targeting the western Negev continued (March 24-April 6, 2010). A total of five rocket hits were identifed in Israeli territory; four others fell inside the Gaza Strip. Three mortar shells were also fired, two at an IDF force during the incident on March 26. There were no casualties. Responsibility for the rocket and mortar shell fire was claimed by the Palestinian Islamic Jihad, the Popular Front for the Liberation of Palestine, and Fatah’s Al-Aqsa Martyrs Brigades. During the week of March 16-23, 2010 there was a significant increase in the number of rockets fired into the western Negev, with nine identified rocket hits. Five other rockets fell inside the Gaza Strip. On March 18 a rocket hit a greenhouse in Netiv Ha’asara, killing a Thai worker. He was the first rocket fire victim since Operation Cast Lead. On March 11, 2010 a rocket hit was identified on a building in the western Negev. There were no casualties. On March 13 a rocket hit was identified in an open area in the western Negev. There were no casualties and no damage. On March 14 light arms were fired at a motorized IDF patrol moving along the border security fence. There were no casualties. On February 25, 2010 an IDF patrol found a rocket launcher and rocket near the security fence. The launcher was detonated in a controlled explosion by IDF experts. On March 1an IDF tank shot at a squad of Palestinians who approached the security fence near Beit Lahiya in the northern Gaza Strip, killing one terrorist and wounding others. A search of the area revealed a mortar and detonation system. An anti-tank missile was fired at the searchers. There were no casualties reported. During the week of February 17-23 two hits (apparently mortar shells) were identified near the security fence inside the Gaza Strip. The Democratic Front for the Liberation of Palestine claimed responsibility for the fire, aimed at an IDF force. On February 18 an IED was detonated against an IDF patrol, lightly wounding one soldier. On February 10, a squad of suspicious Palestinians was identified and fired on near the Erez crossing. On February 12, one rocket hit was identified in the western Negev. There were no casualties and no damage. An IDF force identified a squad of armed Palestinians approaching the security fence in the central Gaza Strip. During the week of February 2-9, 2010 two rocket hits (Feb 3 and 7) were identified in open areas near population centers. There were no casualties and no damage. Two rocket hits were identified in open areas in the western Negev on January 20 and 24. There were no casualties and no damage. During the week of Jan 13-20, 2010 three rocket hits and one mortar shell hit were identified in open areas in the western Negev. In addition, a number of rockets and mortar shells were fired and landed in the Gaza Strip. There were no casualties and no damage. 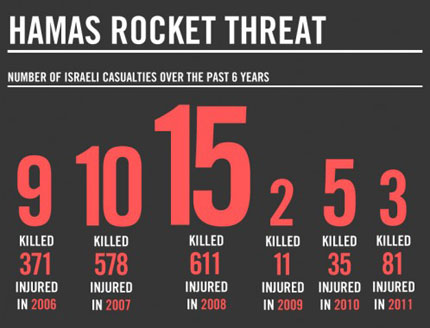 During the week of Jan 6-12, 2010, seven rocket hits were identified in Israel, most on January 7. In addition, an IDF force was shot at near the Karni crossing (Jan 7), and an IED exploded near an IDF force patrolling along the security fence (Jan 10). During the week of Dec 30, 2009 – Jan 5, 2010, two rocket hits were identified in the western Negev. For the first time since Operation Cast Lead, a rocket hit was identified in the southern Israeli city of Netivot (Jan 2). Responsibility was claimed by the military-terrorist wing of the Popular Front for the Liberation of Palestine. There were no casualties. One women was treated for shock. In addition, a mortar shell was fired at an IDF force near the security fence (Jan 4) and four mortar shells were fired at the Kerem Shalom and a rocket at the Kissufim crossings (Jan 1). On December 31, 2009, a number of armed Palestinians opened fire at an IDF force patrolling near the security fence in the northern Gaza Strip. During the week of December 15-22, 2009, two rocket hits were identified in the western Negev (December 16). They fell in open areas, there were no casualties and no damage. On December 13, 2009 two rocket hits were identified in the western Negev. They fell in open areas, there were no casualties and no damage. On December 12 Palestinians opened fire with light arms on an IDF force in the Kissufim region. There were no casualties. An IDF force shot at five Palestinians suspected of terrorist activities sighted in Israeli territory after an RPG was fired at an IDF jeep. During the week of December 1-8, 2009, one rocket hit was identified in an open area in the western Negev (December 4). There were no casualties and no damage. On December 4 an IDF patrol was attacked with RPG and light arms fire near the security fence in the central Gaza Strip. During the week of November 17-24, 2009, four rocket hits were identified in open areas near towns. On November 16 two mortar shell were fired.There were no casualties and no damage. On November 18 an IED was used to attack an IDF force near the security fence south of the Karni crossing. Light arms were used to attack an IDF force near the Kissufim crossing. One rocket hit was identified on November 13. It landed in an open area in the western Negev; there were no casualties and no damage. An IDF force identified a squad laying an explosive device in the northern Gaza Strip, and opened fire. One rocket hit was identified on November 9. It landed in an open area; there were no casualties and no damage. One rocket hit was identified on November 2. It landed in an open area; there were no casualties and no damage. Light arms were fired at an IDF force near the Karni crossing on October 28. During the week of October 20-27, 2009 one rocket hit was identified in an open area near a town in the western Negev on October 21. There were no casualties. On October 20, three mortar shells were fired at an IDF force and on October 21, shots were fired at an IDF force near the security fence. During the week of October 12-20, 2009 two rocket hits were identified in open areas in the western Negev (October 13 and 18). There were no casualties and no damage. On October 7, 2009 one mortar shell hit was identified in an open field near Sderot (October 7, 2009). There were no casualties and no damage. On October 6 civilians working near the Karni crossing were attacked with light arms fire. During the week of September 29 – October 5, 2009 five rocket hits were identified in open areas near Israeli communities (another rocket fell inside the Gaza Strip), There were no casualties and no damage. In addition, light arms were used to attack IDF force and Israeli civilians near the security fence. During the week of September 22-29, 2009 three rocket hits were identified in the western Negev (the Palestinians fired other rockets which landed inside the Gaza Strip). One mortar shell was fired. There were no casualties and no damage. Shots were fired at IDF patrols and Israeli civilians working near the security fence, near the Sufa and Kissufim crossings. During the week of September 15-22, 2009 two rocket hits were identified in the western Negev and a mortar shell was fired at civilians working near the security fence. IDF patrols and Israeli civilians working near the security fence were also shot at, mostly with light arms. September 16: A mortar shell was fired at civilians working near the Kissufim IDF post. September 19 (Jewish holiday of Rosh Hashanah): Two rocket hits were identified near the Israeli city of Sderot. There were no casualties and no damage. September 20: An IDF force shot at a terrorist squad planting IEDs southeast of Jabaliya, killing two terrorists and wounding three. September 21: Light arms were fired at Israeli civilians working near the Nahal Oz fuel terminal. There were no casualties. On September 4 and September 7, 2009 two rocket hits were identified in open fields in the western Negev. There were no casualties and no damage. On September 3, 2009, during a 24-hour period, seven mortar shells were fired, four at an IDF force near the security fence and three at communities in the western Negev. There were no casualties and no damage was done. In an exceptional statement, the Iz a-Din al-Qassam Brigades, Hamas’ military-terrorist wing, claimed responsibility for the attacks. 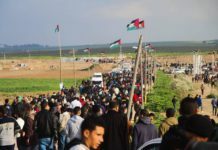 Palestinians also shot at civilians working the near security fence, damaging a tractor, and at an IDF force near the security fence in the central Gaza Strip which returned fire. On August 30, 2009 Palestinians opened fire at Israeli civilians conducting an engineering project near the security fence in the northern Gaza Strip. There were no casualties and no damage. On August 29, 2009 a rocket hit was identified near a village in the western Negev. There were no casualties and no damage. On August 27, 2009 Palestinians opened fire at Israeli civilians engaged in non-military activities near the security fence in the southern Gaza Strip. There were no casualties and no damage. On August 24, 2009 two mortar shells were fired into Israeli territory. One landed in an IDF base north of the Gaza Strip, slightly wounding a soldier. An hour earlier three suspicious Palestinians were identified near the security fence, apparently trying to plant an IED. During the week of August 12-18, 2009 one mortar shell was fired at Israel civilian working near the border fence. During the week of August 4-11, 2009 a rocket hit was identified in the western Negev. On August 10, Israeli civilians working near the Karni crossing were attacked by small arms fire. On August 9, two mortar shells fell near the Erez crossing inside the Gaza Strip. The attack occurred as a Palestinian heart patient was being transferred to an Israel ambulance on his way to medical treatment in Israel. On July 23, 2009 light arms were fired from the Gaza Strip at a group of Israeli civilians working near the Sufa crossing. There were no casualties. On July 16, 2009 a rocket hit was identified south of Kibbutz Nahal Oz. There were no casualties and no damage was done. On July 19 armed Palestinians launched RPGs and mortar shells at an IDF force patrolling the border fence near Kibbutz Nahal Oz. On July 7, 2009 a mortar shell was fired at an IDF patrol near the Karni crossing, falling in Israeli territory. On July 11 a mortar shell was fired near the Karni crossing, falling inside the Gaza Strip. On July 2, 2009 an IDF patrol was fired on south of the Karni crossing. On July 5 three mortar shells were fired at an IDF patrol near the Sufa crossing. On June 25, 2009 light weapons were fired at the Nahal Oz fuel terminal; there were no casualties. On June 29 two Palestinians were observed placing an IED 2 kilometers southwest of the Karni crossing. On June 21, 2009 an IDF force on routine patrol uncovered four IEDs placed along the border security fence in the Kissufim region of the western Negev. As the IEDs were being disarmed, two mortar shells were fired and light arms were used to attack the soldiers. There were no casualties. During the week of June 9-15, 2009 one rocket hit was indentified in the western Negev. There were no casualties and no damage was done. 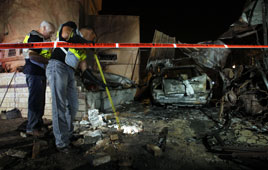 On May 19, 2009 a rocket hit a house in the southern city of Sderot, causing damage. Two people were treated for shock. During the week of May 5-12, 2009, four rockets and two mortar shell hits were identified, all of them in non-inhabited areas. There were no casualties and no damage was done. During the week of April 28 – May 5, 2009, one rocket and three mortar shells were fired at Israel. Two rockets were fired at the western Negev, on April 15 and 17, falling in open fields. During the week of March 31 – April 7, 2009, two rockets and two mortar shells were fired at Israel. On March 31, following the prevention of an attempt to place an IED near the border security fence, two rockets and a mortar shell were fired at western Negev communities. During the week of March 24-30, 2009, two rockets and one mortar shell were fired at Israel. During the week of March 17-23, 2009, three mortar shells were fired at IDF forces operating along the border security fence. Hamas’s Izz al-Din al-Qassam Brigades claimed responsibility for the mortar shells fired on March 22. During the week of March 9-16, 2009, 14 rockets and four mortar shells fell in Israel, most of them in open areas, causing neither casualties nor property damage. During the week of March 3-8, 2009, 17 rockets were fired, one of them hitting the city of Netivot. There were no casualties or property damage. Nine mortar shells were launched. On March 5 an anti-tank missile was fired at an IDF patrol moving along the border security fence. In response the Israeli Air Force attacked the squad. The Palestinian Islamic Jihad claimed responsibility for the missile attack. During the week of February 25 – March 3, 25 rocket hits were identified. 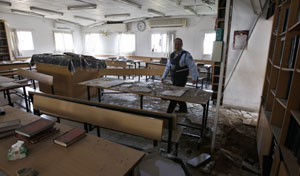 Two 175mm upgraded long-range rockets with a maximum range of 18 kilometers (11 miles) hit Ashkelon on February 28, one hitting a school building and causing serious damage. No mortar shells were fired. • Mar 1 – Nine rocket hits were identified in the western Negev, one hitting a house in Sderot. No casualties were reported. • Feb 28 – Seven rocket hits were identified, including two long-range rockets that struck in Ashkelon, one causing heavy damage to a school building when shrapnel penetrated the walls of several classrooms. Seven people living nearby suffered stress-related trauma. • Feb 27 – 2 rocket hits were identified. There were no casualties and no damage was caused. • Feb 26 – 3 rockets landed in Israeli territory, two in Sderot. One rocket hit a house and the other landed in an outdoor area near the industrial zone. There were no casualties, but the house was damaged. • Feb 19 – Four rocket hits were identified – one fell near Sderot. There were no casualties and no damage was reported. • Feb 20 – Six mortar shells were fired at IDF forces. There were no casualties and no damage was reported. • Feb 20 – A three-man Palestinian terrorist squad placed an IED four kilometers northeast of the Kissufim post, and then fled. • Feb 23 – Two rocket hits were identified near Sderot. There were no casualties and no damage was reported. A terrorist squad attempted to place an IED three kilometers north of the Kissufim post. The Israeli Air Force attacked the squad. During the week of February 10-17, sporadic daily rocket and mortar shell fire continued targeting western Negev towns and communities, as well as IDF forces operating along the border security fence. This week 13 rockets were fired, one of them a 122mm long-range Grad rocket, which landed southwest of the city of Yavneh. In addition, six mortar shells were fired, mostly at IDF forces. Two mortar shells were fired at an Israeli Navy vessel near the Gaza shore, and a number of IEDs were detonated against IDF forces. In all the above incidents there were no casualties and no property damage was reported. Jan. 20 Terrorists opened fire at IDF force south of Kissufim crossing. No casualties or property damage reported. Jan. 20 Terrorists shot at IDF force near border security fence in central Gaza Strip. The IDF force returned fire. No casualties or property damage reported. Jan. 20 Eleven mortar shells fired at IDF forces and into Israeli territory. No casualties or property damage reported. Jan. 25 Terrorist squad tried to carry out rocket attack against Israel. One rocket fired, fell inside Gaza Strip. PFLP Palestinian media reported Hamas prevented the rocket fire. Jan. 27 An IED was detonated against IDF patrol north of Kissufim. A network linked to the global jihad. IAF struck a motorcyclist in Khan Yunis area & weapons smuggling tunnels in Rafah. A soldier was killed and three wounded, one of them critically. Jan. 28 A rocket fell in Israeli territory near the southern Gaza Strip. Fatah and the PIJ IAF attacked weapons manufacture facility in Rafah. No casualties or property damage reported. Jan. 29 A rocket fell in an open area near Sderot. No casualties or property damage reported. Jan. 31 A rocket fell south of Ashkelon. No casualties or property damage reported. Feb. 1 Four rockets fired at western Negev towns and villages. IAF attacked a Hamas security post northeast of Nusseirat. No casualties or property damage reported. Feb. 1 Armed Palestinians shot at IDF force near Kissufim in western Negev. No casualties or property damage reported. Feb. 1 Six mortar shells fired into Israeli territory. The IAF attacked six smuggling tunnels in Rafah. Two IDF soldiers sustained minor shrapnel injuries. Feb. 2 A rocket and two mortar shells were fired into Israeli territory. A PRC group claimed responsibility for the mortar shells. IAF attacked the rocket launching squad, killing one operative. No casualties or property damage reported. Feb. 3 A 122mm Grad rocket fell between two buildings in the city of Ashkelon. Three people were treated for shock and several vehicles damaged. Feb. 6 Rocket fired from the area of Beit Lahiya in northern Gaza Strip hit western Negev. Another rocket fell south of Ashkelon. Feb. 8 Rocket fell in kibbutz parking lot in northwest Negev. Another fell south of Ashkelon. Several vehicles in the parking lot were damaged.